The book starts with a humorous period of training that Baa receives from an older ram to prepare him for the outside world. Then as Baa enters the Fabulous Forest, he meets Mary and her pony Lightning. Baa decides to stay with them until he can find more adventures, which he promptly does. 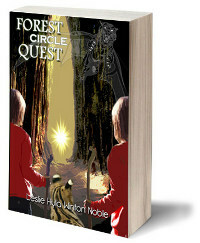 The book is funny and captivating, and adventure everywhere. This book speaks to young readers, as young as nine, but it doesn't stop being funny though one grows older. True to Leslie Noble's uplifting style,there is a message in this book that even very young readers will "get". It doesn't matter how small or weak you start out being, all that matters is what you do with who you are. You can do it! The story romps around in nursery rhymes for a while; puns abound, and everything is - not quite the way you'd expect it. Mary may have a little lamb but his fleece is certainly not white, and woe betide anyone who tries to harm Mary! The story resolves into a fantasy novel in a very satisfying way. And very much like his other novels, there's never a dull moment.